So, someone in my neighborhood was recently found to have embezzled $35K over the last two years from the school-parent association at my son’s elementary school while serving as treasurer. I don’t know her – I don’t even know who she is, or even if she’s a she – but this development may have accelerated the rise of The Misfortune Of Marion Palm up my TBR list. Emily Culliton’s novel is about Marion Palm, a woman living in Brooklyn who goes on the lam after embezzling $180k from her daughters’ school. This is an odd book. The story is told in a series of short chapters, told in the alternating viewpoints of Marion, her daughters Ginny and Jane, her husband Nathan, some of the people who work at the school and a detective who is investigating Marian’s departure. There is not a single likable character in this book, nor are they even relatable. Marion is oddly cold and unfeeling, admitting easily that she doesn’t miss her children after going underground. Nathan, her husband, is pretty pathetic until he launches a lifestyle blog about being a single dad, and then he’s just an opportunist. The daughters are cold and weird (and we see a glimpse of their future and it isn’t particularly bright). The school board members are gossipy and self-absorbed. Culliton DID do a decent job of exploring how Marian started with the embezzling – and why she stuck with it – which was of course why I wanted to read the book. So that was satisfying. But I found the process of reading The Misfortune Of Marion Palm quite a slog. I wasn’t rooting for Marion or hoping she’d get away with the crime, because she was so unlikeable and didn’t have a plan of any sort for the money. Culliton has a sharp eye for detail and spares no one with her snark, but that didn’t make the story worth it for me. I listened to The Misfortune of Marion Palm on audio. Narration by Saskia Maarleveld was fine, if a bit flat. She didn’t infuse much emotion into the characters, but it’s hard to fault her for that, given how they were written. Honestly, I just wanted to finish it and move on. I’d be curious to hear from someone who liked The Misfortune of Marion Palm. There are a number of 5 star reviews on Goodreads so they are clearly out there. What did you like so much about this book? Posted on September 12, 2017 by gayle. 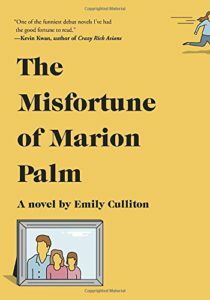 This entry was posted in Audiobooks, Fiction and tagged audiobook, emily culliton, the misfortune of marion palm. Bookmark the permalink. On the one hand, the premise here sounds interesting, but on the other the fact that the characters aren’t even relatable means I’d probably react the way you did. I enjoy an unlikable character, but there has to be something realistic about them. As for the 5 stars on GR, I never trust them when they’re very early readers. Or if they won the book from a GR giveaway. I’d love to help you out with this one, but I trust you and if you didn’t like it I doubt I would! I ended up liking this book more than you did, but not by *too* much and I understand your qualms. The characters were VERY unlikable, Marion is a truly bad person, and Nathan isn’t far behind. I liked the narration better than you did — I found the narrator’s voice ideal for both Marion and Nathan. But what a bunch of awful people who,m you would never choose to be friends with!